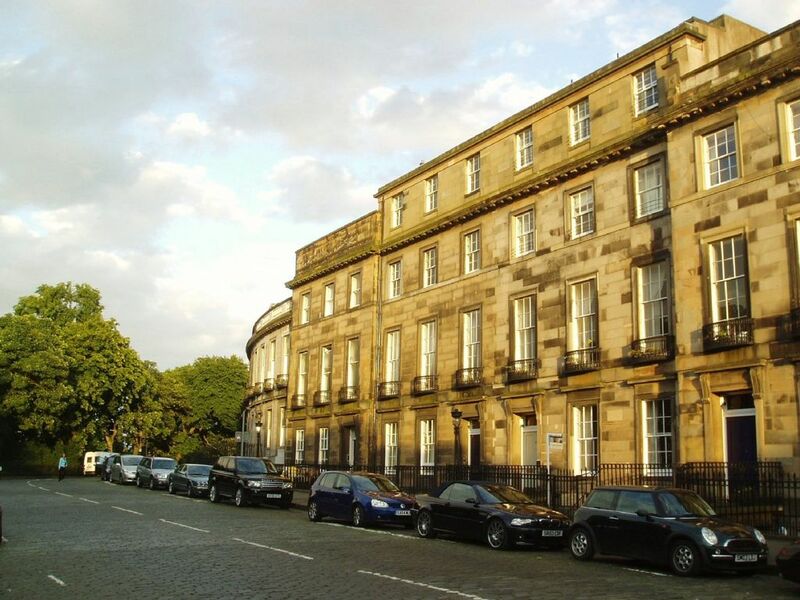 Designed by the architect William Playfair in the middle of the 19th century, Carlton Terrace, along with the adjacent Regent and Royal Terraces, forms part of Edinburgh's prestigious New Town district. This comfortable one bedroom apartment within Carlton House has recently been refurbished and furnished. Situated on Carlton Terrace, one of Edinburgh's most elegant cobbled streets, this second floor apartment is in a prime location for the city centre attractions as well as its famous viewpoints such as Calton Hill & Arthur's Seat. The Royal Mile and Princes Street are both only a 10 minute walk away. The apartment's position at the rear of the building ensures privacy, tranquillity and a south facing aspect. Please note, this is a non smoking apartment. Please also note that there are 2 flights of stairs to reach the apartment and there is no lift so it may not be suitable if you are elderly or have breathing difficulties. Local Vicinity: As you walk out of the front door of Carlton House and face London Road Gardens, it is difficult to believe you are only a 5 minute walk from the vibrant restaurant and entertainment district of the East End of Edinburgh. The Playhouse Theatre which stages the latest musicals and shows is a 5 min. walk away and Harvey Nichols and John Lewis department stores are also within 5-10 mins. walk. Add another 5 mins. walk and you'll reach the shopping district of Princes Street and George Street. Parking: Street parking is available on Carlton Terrace on a metered basis from 08:30-17:30 Mon-Fri but with max. stay 4 hours at any one time. Outside of these times, parking is free. You are virtually guaranteed to find a place right outside the property at any time. A electrical shaver socket is located within the bathroom cabinet. The apartment has been tastefully furnished in keeping with the period of the property and the rooms enjoy high ceilings, ornate cornices and dado rails. Both the living room and the bedroom have large south-facing astragalled windows with full length curtains and tie-backs. The apartment has gas central heating throughout. The sitting area has a 3-seater leather sofa which can be converted into a bed if required and the entertainment systems are of the highest quality. The Loewe TV receives Freeview channels, incorporates a hard drive recorder and is attached to the Blu-ray DVD player by HDMI connection. The Bang & Olufsen CD/Radio provides outstanding sound quality and is set up for MP3 player connectivity. There is a selection of books, CDs and DVDs for your enjoyment. The dining table can seat up to 4 people. It is hard to imagine a more well placed, well equipped, comfortable and agreeable apartment to stay for a week. Elegant, with a touch of class, in a quiet part, an interesting walk from the centre, and just below the amazing Carlton Hill, with its spectacular views of the city. Highly recommended. The photos don't do this beautiful apartment justice. My wife and I were absolutely blown away by everything. Mark takes extremely good care of his property and it shows. It was close to the city centre, just a 20-minute walk from the best sights and fantastic restaurants. It was nice to be tucked away from the craziness of downtown Edinburgh (it does get quite busy with tourism, especially on the weekends), yet the city was so close and easily accessible by foot, taxi or even bus. If you're looking for the perfect, quaint Edinburgh getaway in a beautifully restored heritage flat that's close to the city centre, then look no further. Simply put, we've stayed in many amazing B&Bs, hotels and the like, and Mark's apartment is at the top of the list. If you want the true, rustic feeling of Edinburgh, this is your place. P.S. Mark - thank you again for being such an amazing host. Whether it was recommending some great nearby restaurants, being very flexible with timing or helping me retrieve my forgotten passport at the last minute, we are so thankful for everything! We had a great time. The apartment is lovely and so central. Unfortunately we were issued with two parking tickets outside the apartment. We thought that there was free parking. We were given no intimation about parking costs when we booked. We now face a £60 parking fine which was unexpected. The initial booking should have pointed out parking costs or a issued a residents parking voucher as part of the procedure. We used public transportation in Scotland, and in Edinburgh we never took a bus or taxi, because Carlton House positioned us so well for all the sights and services -- we just walked: 20 minutes to Waverley Station and about the same to a big Sainsbury's grocery store. The apartment, beautifully furnished and with high ceilings, is on the third floor, up 47 stairs, quiet and comfortable; the owner lives next door and is helpful and accessible. My wife and I stayed a week and enjoyed the whole time. Edinburgh vacation residence at its finest! Located in a quiet residential neighborhood, this flat is the finest we have ever stayed at. The thoughtful finishes of the flat made coming home after a long day of exploring the sights and sounds of Edinburgh something we looked forward to everyday. One disclaimer, it is on the top floor with no lifts, but the views from the windows more than made up for the flights of stairs. Since there is no lift, it may not be idea for some travelers. Quiet, charming neighborhood, easy walk to Old Town and New Town. The flat was well appointed, with a lovely view of Arthur’s seat. All sights, restaurants and transportation are within walking distance. The owner, Mark, is gracious and accommodating. Overall an excellent experience with the flat and in Edinburgh. Edinburgh is steeped in history and as well as providing a city break location, it is also ideally situated for excursions to the beaches and golf courses of East Lothian and Fife. The city is famous for its Georgian architecture, its open spaces and also its festivals, notably the world's largest arts festival in August and Hogmanay at New Year. The cosmopolitan feel of the city owes its thanks to its foreign visitors, university students and of course the local residents. A walking tour of Edinburgh's architectural highlights starts on your doorstep and should go on to include the Royal Mile and the Scottish Parliament which are both within a very short distance. Calton Hill, situated just behind Carlton Terrace is a must for any visit to Edinburgh as it offers fine views of the city and across to Fife and East Lothian. Holyrood Park with Arthur's Seat and Salisbury Crags are also within easy walking distance and here it is easy to forget you are in a city at all. PLEASE NOTE, ALL RATES ARE INCLUSIVE OF WATER, GAS, ELECTRICITY, LINEN & TOWELS AND LOCAL TAXES. The above rates are for 1-2 people. There will be a supplement for a third person which will be shown on any quote. Credit card payment is available via the online booking facility. Payment is also accepted in GBP or Euro by direct bank transfer. A 25% deposit is required in order to secure a booking.